Neurorobotics is one of the most ambitious fields in robotics and will play a major role in the newly announced Human Brain Project. This project was selected by the European Commission as a flagship project and will receive a prospected funding of 1 billion euro for a runtime of 10 years. The goal of the Human Brain Project is to pull together the highly fragmented knowledge in the neurosciences and to reconstruct the brain, piece by piece, in supercomputer-based models and simulations. It should lay the technical foundations for a new model of brain research that is based on Information and Communications Technologies (ICT), driving integration between data and knowledge from different disciplines, and catalyzing a community effort to achieve a new understanding of the brain, new treatments for brain disease and new brain-like computing technologies. Data: generate strategically selected data essential to seed brain atlases, build brain models and catalyze contributions from other groups. Theory: identify mathematical principles underlying the relationships between different levels of brain organization and their role in the brain’s ability to acquire, represent and store information. ICT platforms: provide an integrated system of ICT platforms providing services to neuroscientists, clinical researchers and technology developers that accelerate the pace of their research. Applications: develop first draft models and prototype technologies that demonstrate how the platforms can be used to produce results with immediate value for basic neuroscience, medicine and computing technology. We at the Technische Universitaet Muenchen in Prof. Knoll’s research group will coordinate the part of the project that focuses on “Neurorobotics”. Neurorobots are robotic systems that are comprised of a controller, a body, actuators and sensors, and whose control architecture is derived from a model of the brain. 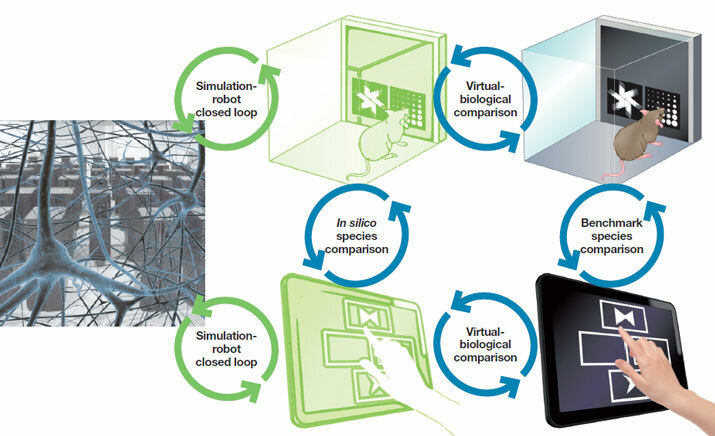 In the Human Brain Project, they are controlled by generic brain models that will make it possible to study them in closed-loop experiments: that is, experiments where the brain is inside a body, embedded in a realistic environment where the robot’s actions influence future sensory inputs. It is within the Neurorobotics subproject that the feasibility of the conceptual models will first be tested with simulated and real systems. Role of Neurorobotics in the Human Brain Project. 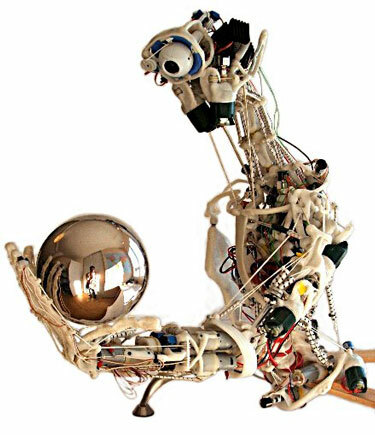 To design a robot for use in such an experiment, researchers will connect models of sensors and actuators to a brain model, calibrate the robot brain so that it can process the relevant signals, and translate the model’s neural activity into control signals for the robot. They will then use classical techniques (lesion studies, manipulations of neurons etc.) to identify the control architecture for specific tasks. The advantage of this approach is that it allows researchers to monitor and control all states and parameters of the experiment (brain, body, and environment) – something that is technically impossible to achieve in the laboratory. Robot for neurorobotic experiments, created by Alois Knoll and his team at the Technische Universität München, Germany. © Technische Universität München. We will be developing a Neurorobotics Platform that will offer scientists and technology developers the software and hardware infrastructure they will need to connect pre-validated brain models to detailed simulations of robot bodies and environments, and to use the resulting neurorobotic systems in in silico experiments and technology development. Work in neurorobotics will lay the foundations for a new generation of computing systems and machines with cognitive capabilities that are absent in current technology, including a degree of autonomy and an ability to learn. This raises the issue of legal liability when a neurorobotic system injures humans or their property – a topic already raised by the advent of autonomous vehicles. The Human Brain Project Ethics and Society Programme will contribute to this debate. The project has the potential to produce economically and socially valuable results even before it achieves its ultimate goals are met. All the planned technology platforms will be operational within the first thirty months. The first informatics-based techniques for the diagnosis of Alzheimer’s and other neurological and psychiatric disorders will be available before the end of the ramp-up phase (first 2.5 years). On the same time scale, the project will develop the first large-scale neuromorphic computing systems based on simplified, yet biologically realistic models of brain circuitry, and the first neurorobotic systems for use in closed-loop experiments and applications development. Photo of a neuromorphic chip designed by the HPB group of Prof. Karlheinz Meier. 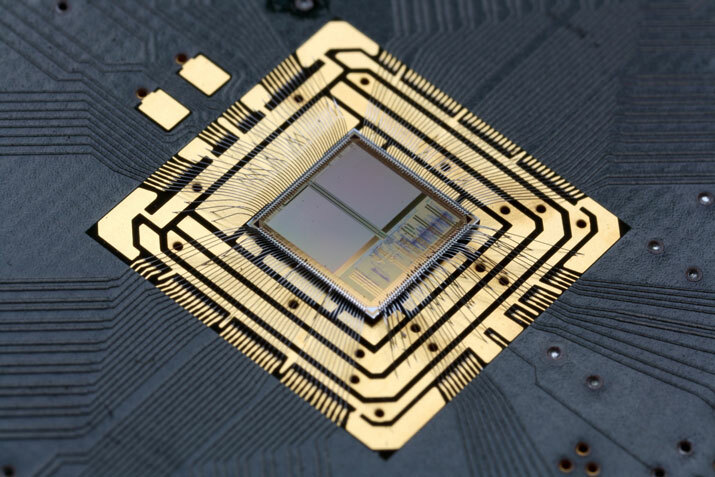 The chip features 384 neurons, 100.000 synapses and operates at a speed of approxinately 100.000 times biological realtime. © Heidelberg University, Germany. The project will start in just a few weeks, so follow us on Twitter (@HumanBrainProj), Facebook (Human Brain Project), Google Plus (Human Brain Project) and the Frontiers Research Networking Community. For more information, visit the Human Brain Project website, or download the The HBP Report Excecutive Summary.